Dragon1 is saas software with specific tools, such as an UML Tool. This enables you to create any UML diagram you like as individual or as team. Purchase here your user license and start with your first interactive UML diagram. UML stands for Unified Modeling Language and is managed by OMG (Object Management Group) www.omg.org. UML is a powerful language that can be used to model organizations, businesses, information systems, applications, software and technology. All with some limitations and of course your knowledge about the topic you are modeling, to get the most out of UML. There are a lot of UML Tools available in the world, but on the Dragon1 platform with its specific UML Tool you can create UML diagrams with popups, sounds, tracking and tracing and you can click through to other interactive diagrams or project documentation. Probably the most well-known diagrams of UML are the Use Case examples. Look how easy it is to create an UML Use Case diagram using the Help and Learn. Drag some use cases, actors and functions onto the default opened visualization canvas. Enter some names for the use cases, actors and functions and save your uml case diagram. Click on the share link for the Content Viewer and paste it in your email and email it to anyone to share it or add it to your ePortfolio. Now you have successfully created and shared your first use case example on Dragon1 as your UML Creator. Read more about UML Diagramming here. 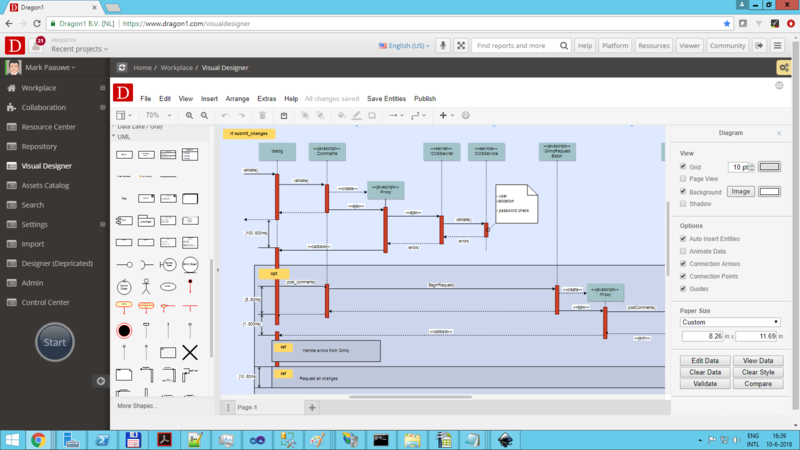 We hope we have inspired you to start using UML Tools for creating UML diagrams. We know for sure you will enjoy working with them! If you would like to use Dragon1 as UML Tool, just create a free trial account (no credit card required!) as first step. For questions, email us at info@dragon1.com.